DSYNCHRONIZE is an outstanding file and folder synchronizing tool thanks for Dimio. 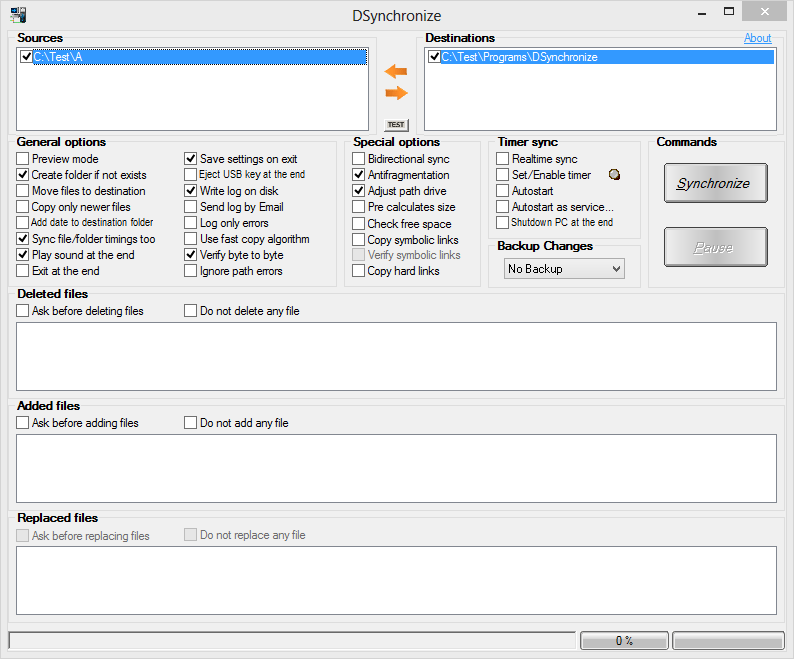 "DSynchronize is a stand-alone utility that let you periodically synchronize two or more folders in a LAN. Is also possible to specify the time and the day on which the sync have to run, and to create some "filters". Yes, this is a great little sync and backup program. It also allows "real-time" synchronization of folders, so that changes you make on your hard drive can be immediately made to your USB removable media in the background if you have it plugged in. 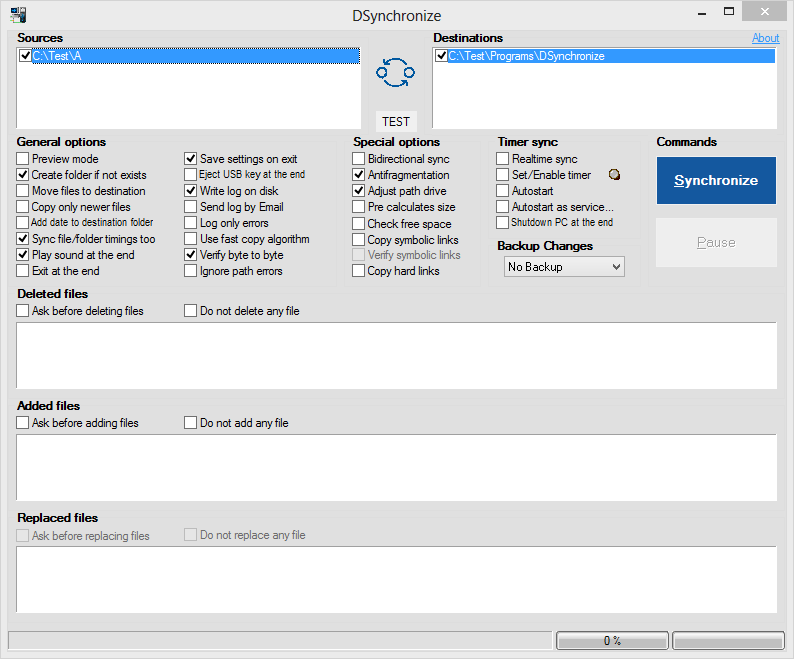 Synopsis: DSynchronize is a stand-alone utility that let you periodically synchronize two or more folders in a LAN. Is also possible to specify the time and the day on which the sync have to run, and to create some "filters". There is also an option to add the date and time of the sync to the name of the folder, to obtain a series of backups, classified by date and time. How to extract: Download the ZIP package and extract to a folder of your choice. Launch the program by double-clicking on DSynchronize.exe. Posted to the database. Thanks! How much Keefe is in this movie? Miles O' Keefe! That's a very useful portable app. One suggestion would be to enable a zoomed or exportable version of the files deleted/added/replaced. I think the change log (it's in Italian) says he ''fixed a bug in the timed sync'' mode. "DSynchronize v2.30.1" (http://www.portablefreeware.com/forums/ ... php?t=2454). -- See also "Dimio's Tools" (http://www.portablefreeware.com/forums/ ... .php?t=619) and user spicydog test report (http://www.portablefreeware.com/forums/ ... 216#p35216). Last edited by Midas on Sun Jan 31, 2016 4:25 am, edited 1 time in total. Just took a look at the program and it's options have come in line with more of a file copy tool (includes move and verify options) so I updated the category and entry. Too bad that nowadays almost every developer is following the abominable M$ flat style. If this disgusting trend persists (I am sure it will) I will soon be using only legacy software. - New graphics. As a result of the survey in which he asked you to choose between the old interface and a new interface in Win10 style (the new interface won but only slightly), it was decided to renew the DSynchronize graphics without distorting the style; in two words, an intermediate style has been adopted. - Now, during synchronization, the StandBy is disabled, so there is no risk that the procedure may stop halfway. - Now file names and directories are also synchronized if they are equal but not from the point of view of capital / minuscule. Now the attributes of files and folders are also synchronized , even if the contents of the file (or folder) are identical. - Completely revised the analysis procedure of the differences between source and destination (it should now be much more precise).